As we approach the building, we see a bus parked in the main entrance. Some of the Mozambique One World University’s students have just come back from a four month bus trip across Southern Africa, one of the highlights offered by the center’s three year program to become a teacher. Walking through the hall, there are small groups of students scattered about. They speak quietly. The only sound breaking the silence far away from the hustle and bustle of the city is the birds singing. The One World University was established in Mozambique in 1998 with the aim of strengthening the country’s educational system thanks to the two degrees it offers: one in education and another in community development. 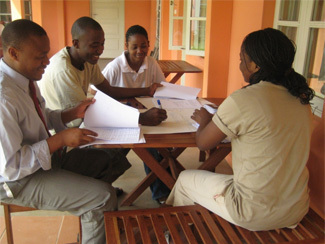 The campus is located in Changalane, 80 kilometers from the capital Maputo. Set back from the main road, surrounded by acres of land, and close to the Pequenos Libombos mountains near Swazilan, it has the ideal atmosphere to study. 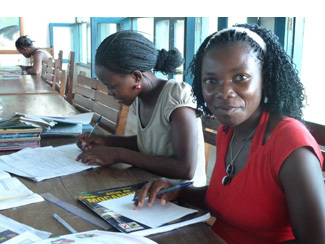 “The students are close to the communities, in rural Mozambique, where most of them come from. Here they have all the necessary quietness to study and still be in touch with the people”, explains Dina Bak, OWU’s deputy headmistress. Since the mid-1990s, following a long civil war which dealt a serious blow to the Mozambican education system, the situation has rapidly improved in the country. But much remains to be done. A large proportion of primary school teachers do not have adequate training, and double or triple-shift teaching has been introduced to cope with the shortage of classrooms and teachers. In the lower primary level, there is an average of one teacher for every 74 children. To date, One World University has graduated 296 Bachelors of Education. Antonio is in his last year and affirms he is almost ready to start working as a teacher. “Besides the theoretical courses, I have learnt how to approach the students. A child from a rural area in Northern Mozambique is not the same as a child from Johannesburg. The education system varies from country to country”, he explains. Most of the graduates from OWU work now as teachers in Humana People to People’s 24 Teachers Training Colleges in Mozambique, Malawi, Angola and India. The second degree program in community development started in 2009 inspired by Mozambican President Armando Emilio Guebuza, who said, “I would like for there to be a course for fighting poverty. This is what we need. People who work in the districts and with the people. You should graduate bachelors in the fight against poverty”. And so ADPP Mozambique did. The ‘Fighting with the poor’ degree focuses on training students in the theory and practice of transformational processes in society, and emphasizes the responsibility of educated people to bring about justice and equality. “Half of the program takes place within the communities. We spend time there, working with them, getting to know their needs and trying to change things”, explains Olivio, graduated by the OWU and part of the current staff in the centre: “It is very gratifying to see how it is possible to improve people’s lives”.